You know an album’s made an instant impression when your first response on reaching the end of the last song is to immediately give the record a second airing, as well as committing to take the time to discover the artists’ back catalogue. 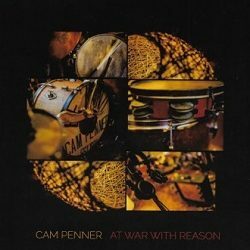 Such is the case with Cam Penner and Jon Wood’s ‘At War With Reason.’ Almost impossible to pigeonhole musically, the whole ensemble makes more sense once you realise that Cam Penner listens almost exclusively to hip-hop, soul and electronica because he doesn’t want his creativity to be unduly influenced by other Americana artists. The resulting rap-infused folktronica – for want of a better description – is a glorious mishmash of primal sounds, tape loops, stream of consciousness, sounds effects, guitar and organ that somehow come together to forge a whole that succeeds in being greater than the sum of its parts. While it’s hard to describe any particular highlights because this feels like it’s intended to be listened to in its entirety (the album coming in at only 33 minutes and 6 seconds long making this a particularly easy venture), ‘Gather Round’ with its looped chant, hand claps and quicksilver guitar is immediately affecting: “C’mon People, gather round there’s sense to be made from all the trouble and the doubt..” sings Cam Penner – and proves the perfect introduction to this song cycle. Quite extraordinary is ‘Lights On (High School Musical),’ which clearly has the mass school shootings in the US as the basis for its lyrical inspiration, but then its telescope broadens out to reveal that its true focus is the 1% who run the world and undertake their power games “in the back rooms with the back slaps, the contracts, clawbacks, traps..” – the profanity at the heart of the song indicative of the rage at the heart of its production. Other standouts on an album that’s full of highs is the insistent ‘Eastside’ – with its sinister opening keyboard sound and razor-like guitar tones – while the gorgeous sounding ‘Over and Over,’ with its plangent guitar, is the most instantly accessible tune on the record. This is a sometimes demanding, but ultimately rewarding, album that bears repeat plays. The fact that both Jon Wood and Cam Penner are able to conjure an array of many and varied, multi-layered sounds has seen them described as aural sorcerers. Long may they continue to cast their musical spells.